There is no middle ground on the mobile part of humanity : either hospitality, or enmity, i.e. various forms of elimination. This is our choice, and our problem for the years to come, perhaps for decades. 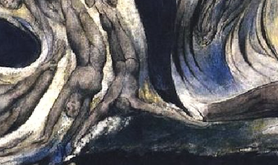 William Blake. 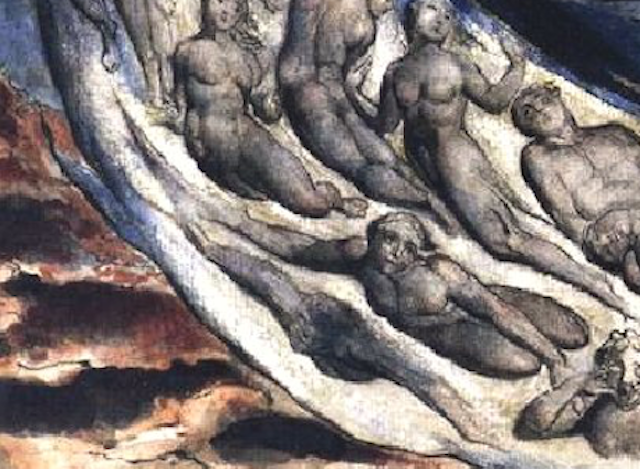 Detail from hell, Canto V of Dante's Inferno. The Agora Europe Series, co-founded by Nadia Urbinati, Etienne Balibar and Caterina Di Fazio, is proud to present Charta 2020, a charter on European integration that declares 20 European public goods that we Europeans should endorse as they are essential to reshaping any future European political space. Charta 2020 was collectively composed by several dozen international activists, academics and politicians at the European University Institute on February 15, 2019, and first presented at the European Parliament on March 20. It will also be presented at the Italian Chamber of Deputies on April 16, at Maastricht University Studio Europa on April 29 before the Spitzenkandidaten debate, and at Columbia University on May 8. The transnational joint launch of #Charta2020 is scheduled for Europe Day on May 9, 2019. Caterina Di Fazio (CDF): Agora Europe has just published its manifesto “For a Political Europe”, which focuses on the political dimension of the European Union, on what we define as European political space, which is based on the principle of freedom of movement and defined by porous borders. You joined us, Etienne, in calling for a “political constitution of Europe”, and for “political unity” in 2017. We argued that the current crisis that Europe is facing (including the so-called migration crisis, the economic crisis, climate change and so on), not only shows the limited power of EU institutions but also makes clear that the current nation-state system has no solution to these challenges. You stated: Europe is today indefensible, we need another Europe. Additionally, you have affirmed that the resurgence of nationalism, or even neofascism, far from being a recurrence of the past, should rather be understood as a pathology of the current stage of the EU. Taking up Machiavelli and the “Machiavellian principle of a New Foundation” of the Republic vs its “corruption” (2017), you called for a “return to the origin”, which in Europe possibly coincided with Spinelli’s 1941 Manifesto di Ventotene. With “Charta 2020”, Agora Europe engaged in a definition of 20 European public goods. We shed light on the need for participatory democracy not to replace but to integrate with representative democracy, and we supported your appeal for collective movements acting transnationally and for local participatory practices to communicate across borders. In his latest manifesto, however, President Macron has also called for a renaissance of Europe. In what do Agora Europe’s new federalist manifesto and your call for a genuine rebuilding of Europe, for a Machiavellian refoundation of the European project, differ from Macron’s? What are the original principles? How can Europe be refounded? Which new foundation? Etienne Balibar (EB): It seems to me that there are two questions combined in your first, but I agree that they are interrelated. One is the question of a “new foundation”: the other is the question of “federalism”. It is in particular because of its bold and explicit “federalist” perspective, combined with radical democratic perspectives, and a special insistence on the social dimension of the European project (very different in this respect from the logic of the “Monnet method”) that I wanted to refer to the Manifesto di Ventotene, which was a product of the anti-fascist struggle in Italy and beyond. I observed that the manifesto of Agora Europe did not refer to federalism, but this did not make me object to endorsing it, because I agree that the concept of “federalism” needs clarification, and I believe that the central idea of a “European political space”, common to all its citizens, will inevitably lead in that direction. What exists in Europe today is a system of pseudo-federal institutions, which doesn’t grant European citizens an opportunity to participate in deliberations and decisions in common, but preserves an ongoing vetoing capacity for national governments (and, as a consequence, paradoxically prevents serious reflection on the transformations of nations and sovereignty in the new global era), and rejects any idea of collectively addressing the huge inequalities (financial, social and territorial) in today’s Europe. It is consequently completely inappropriate to designate this a “new foundation” in the Machiavellian sense. From this point of view, the central idea of the Agora Europe manifesto: that of European public goods, very concretely elaborated in the various sections of the text, is a fundamental innovation in trans-European intellectual discussion. It is precisely what is completely absent from Macron’s idea of “renaissance”, which has certain merits (especially if one doesn’t look too closely at the contrast between what he proposes for Europe, and what he practices in France), and which therefore is brutally rejected both by nationalists like Orban or Salvini and by rigid “ordo-liberals” like the new German christian-democratic leader (who is in fact also a nationalist), but which nevertheless excludes the very possibility of breaking with the existing institutions. Of course I don’t believe that this would be easy, but I believe that it will become the only alternative to dissolution if (and when) the current crisis reaches new stages. CDF: “We tend to think that the external limits of the European Union define the ‘real’ borders of Europe, which is a mistake”, we wrote in 2018. Europe is currently reshaping its imaginary geography, by means of a new process of externalization of its borders, ratified by the agreements with Libya and Turkey. States externalize the management of the waves of human migration and refugees to avoid responsibility. You once talked about the difficulty of determining the limits of France as a nation due to its outremer possessions. Vis à vis the other Europe, and supposed North-South cooperation, how does this phenomenon of the externalization of borders differ from colonialism? EB: Again different interrelated questions are involved here (you have a dialectical mindset…). Borders, generally speaking, are undergoing a transformation in their political status, their social and cultural functions, and their institutional implementation in today’s world. They were invented in Europe, in the framework of the Westphalian world-order (also deemed by Carl Schmitt Ius Publicum Europaeum), and then “projected” into the external arena through colonization, which also meant a continuous population flow from Europe to the periphery with “civilizing” and “exterminist” dimensions. There is, of course, a defensive, and in fact reactionary tendency today to try and imagine that this concept of “border” as a line of “sovereign exclusion” could be transferred from the nation-states to a European Grossraum, but we observe that this project is already collapsing before it is really implemented. The only solution is to invent a differentiated concept of border, more democratic and more “multilateral”, which has the explicit purpose of organizing and regulating exchanges with the external world, not keeping them under “control”. When I said that we could not define the “borders of Europe” in a simple, univocal manner, I had two problems in mind. One, that Europe as a historical, cultural, entity – an Idea if you like – could never become enclosed in a single system of borders. As you know there are multiple “institutional spaces” which enclose Europe – the European Union is only one of them (some include Russia, Turkey, others the United States of America, despite its increasing “isolationist” tendency). But above all, if Europe needs to be “provincialized”, according to the famous title of Dipesh Chakrabarty’s book, it needs also to preserve and enrich its links with all the other parts of the world, on the basis of equality. This leads to the second question: colonialism. Of course the legacies of colonialism, in the form of institutional racism and anti-universalist policies (e.g. the recent – really scandalous – decision of French Universities to impose special fees on foreign students, which in practice means essentially Africans), are everywhere. They are especially visible in the internal policies of such countries as France, Italy, etc. But the geopolitical situation has radically changed. The population flows, which in the colonial era were completely one-sided, have become multilateral. In this respect, European policies in the Mediterranean, which include the “externalization” of borders to suppress migrations and refugees, are disgusting in human terms, but they are not “colonial”. Colonialism in the proper sense was an aggressive European policy with respect to the non-European world, whereas what we observe today are defensive measures, however violent they may be. CDF: Nadia Urbinati and I based our concept of a European political space on freedom of movement, or rather freedom of mobility, to encompass the space outside Schengen, the Mediterranean space. Indeed, defending freedom of movement in the Schengen area risks fortifying European external borders in order to protect European internal space to the detriment of external space. You have recently advocated for a humanist conception of “free movement as a fundamental human right”. Circulation, residence and asylum are rigorous notions contained in the Universal Declaration of Human Rights; yet, as you stated in 2018, their limitation is that “national belonging and territorial sovereignty constitute the absolute horizon”. In other words, it is always up to national sovereignties to decide whether or not to grant the right of asylum and respect international treaties. This doesn’t seem to discourage the “solidarity efforts of civil society” that we are constantly witnessing. 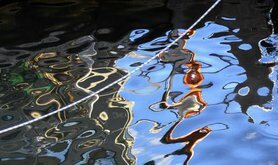 Can civil society prompt EU institutions to restore the legally-binding character of international treaties? Is transnational solidarity the solution? EB: Everybody who is serious agrees that this is a kind of vicious circle. An extension and implementation of the right of circulation is possible only in the form of international agreements and regulations, which must become inscribed in international law and in additions or amendments to the Universal Declaration of Human Rights and the Charter of the United Nations. But these are (by definition) under control of states who are able to block any implementation of those principles which they believe are contrary to their “sovereign” interests. In the juridical sense of the term, they act in continuous “bad faith”. This is not new, however, and it doesn’t lead to the conclusion that juridical principles and rules are worthless. In fact, if this circle were never punctured, there would exist no international legality at all. But it shows that other forces must become involved, that can’t just be ignored. Some are constituted by the struggles and (terribly costly) efforts of the migrants themselves. Others are moral forces: this is the reason why I insisted in some recent writings that you refer to, not only on the “right of circulation” (which is a legal notion), but also on the principle of hospitality, which is a purely moral notion with only “ideological” force. CDF: Matteo Salvini once described Tony Abbot’s “Stop the boats” policy as the best model for the control of migrants. What do you think of Italy’s criminalization of various NGO sea-rescue crews and the sequestration of their vessels – first Juventa, then Aquarius and now Mare Jonio – and the subsequent closure of the ports? Sea rescue has been a pillar of human civilizations since the beginning of history, independent of political beliefs. Whoever knows the sea, knows that we must save lives at sea. Are we the first human civilization to criminalize sea rescue? Salvini is not alone, he is backed by all other European countries, particularly France, despite their occasional expressions of disgust towards his “populism”. CDF: In our Charta 2020 we defined hospitality as a fundamental right and, more specifically, the right of hospitality as a “shared responsibility”. We also called for a Humanitarian Passport. Although international and European treaties protect the right of asylum, what we are currently experiencing, as you argued, is the “reversal of the right of asylum”, which has created a new category, refugees without refuge. Together with solidarity, member-states have abandoned also the very basis of politics, that is to say, responsibility. Vis à vis the current humanitarian crisis, you claimed, “the irony of it all, however, is that part of the solution is within reach: this minimum would be achieved by 1) an official declaration on the ‘state of humanitarian urgency’ on the entire ‘territory’ under the auspices of the European Commission, and 2) the binding commitment of all EU member states to treat refugees with dignity and equity”. Do you advocate, as we did in our Charter, for a Common Asylum System that shall redistribute responsibility among all member-states, unifying the European political space and insisting on a uniform response to its humanitarian crisis? EB: I completely agree. This is a continuation of the previous argument. The bitter irony is that the Italian government was not wrong to claim that other European states (essentially France) refused to treat the refugee problem as a common European problem and put the whole burden on Italy (and we should add, even more so, on Greece). The only solutions (whatever their technical details, and provided they are democratically discussed) are collective solutions. They involve jettisoning the Dublin rules. Then it would become immediately transparent that the “problem” is not impossible to resolve rationally. Populists and fascists are currently blackmailing European governments, in a way which unfortunately seems to work. CDF: Another European public good that Charta 2020 promotes is European Citizenship. But what does European Citizenship mean vis à vis non-EU citizens who are or will be on our soil? How can a political representation of the European people encompass both citizens and residents? Who is the “we” when we say “We citizens of Europe”? EB: I long ago advocated the idea that the emergence of a new type of post-national federal entity would also involve different rules for the granting of citizenship. I also defended the idea that a “European” notion of the citizen could be broader than the notion attached to the “equation” of citizenship and nationality, excluding as much as possible “multiple citizenship” and granting permanent foreign residents (who are also workers, artists contributing to the common good, and taxpayers) more than a “passive” form of citizenship. Clearly it was a mistake to believe that the post-national character of the European Union would make this easier to accept. But of course I stick to the idea that the “European people”, in the substantial sense of the term, is made up of all its residents, possibly with some rules of adaptation. CDF: “Europe… in reality has no borders, rather it is itself a complex border: at once one and many, fixed and mobile, internal and external… Europe is a borderland... Europe is not a space where borders exist alongside one another but rather on top of one another without really being able to merge into one another” we wrote in 2015. You have described the current situation as a “Mediterranean hecatomb of genocidal dimensions… taking place not in a closed territory but in a borderland between states”. Do you still believe that what we are currently perpetrating in the Mediterranean space is a veritable genocide? EB: This was a strong term which I used to provoke a reaction in my readers. Interestingly the Tribunal Permanent des Peuples (the former Russell tribunal, also supported by the Fondazione Basso) which convened in Paris in January of last year, used the expression: “crimes against humanity”, which perhaps is easier to argue for in juridical terms (see the report here). 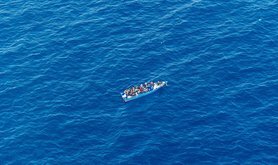 My justification is essentially – as I argued last year in a paper on the “International right of hospitality” published in Le Monde – that the refugees and migrants who are now “errant” or “roaming” in international space (and particularly at sea) are not just individuals, they are “a mobile part of humankind”. It is this “part” that governments are passively or actively trying to eliminate. CDF: Étienne Tassin in his Phenomenology of the Migrant Condition stated that the problem of the migrant is that she does not have access to the public scene, that she doesn’t appear and therefore is not visible. The inalienable “right to have rights” is thus suspended. The freest in the Arendtian sense, namely the freest to move, are paradoxically the least free. Alongside this Étienne, you stress the need for a cosmopolitics, specifying that “foreigners must not be treated like enemies”. The Hobbesian narrative of security and protection vs a perceived risk fails to answer the question: who is the other? The refugee is reduced to her vulnerability. The illegal migrant to a threat. 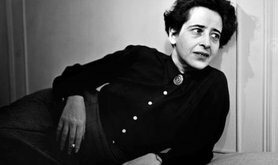 We are currently facing, together with the criminalization of the other, a perceived or constructed “permanent state of exception”, something that not even Carl Schmitt could justify. Lampedusa, Calais, Ventimiglia, Hendaye: in all these cases we saw single nations “‘holding the reception’ for the migrants on behalf of Europe”. You have stated that we must move beyond the refugee category, and that we should not use the words “refugee” or “migrant”, as they are divisive and discriminatory. Shall we rather use, as you suggested, the word “roamer”, or “exile”, which you have defined as the “mobile part of humanity”? And if so, why? Additionally, the Hobbesian double-sided narrative works also the other way around: these people need protection, once their state has ailed to protect them. Who then is responsible for them? Shall we rather use, as you suggested, the word “roamer”, or “exile”, which you have defined as the “mobile part of humanity”? EB: I agree with Etienne Tassin that this is a situation where the Arendtian notion of a “right to have rights” must be vindicated, but also broadened, because in her formulation (at least initially) it was largely dependent on the idea that the essential “political community”, where such rights are granted, is the national community. But her critique of a purely “moral” notion of human rights, as a product of the decomposition of the classical (republican) nation-state (which she may have had a tendency to idealize), quite naturally led to asking, as Etienne Tassin does in his work, what kind of universalist community can be conceived, where the “exiles” are not just victims, but also recognized political subjects. Similar considerations apply to the discussion of Kant’s principle (in his essay on Perpetual Peace from 1796, introducing the modern debate on “cosmopolitanism”): Kant sees only individuals, and he isolates the question of “visit” (i.e. entry into a foreign territory) from the question of “settlement” or “residence” (in part because he is opposed to colonialism, but also because he sees “commerce” as the main form of circulation). However, his principle: not to treat foreigners (and more generally strangers) as enemies has a far greater scope and range of application if we lift these restrictions. And we must do it because, as you rightly indicate, this transformation of the stranger into an enemy is in fact institutionalized by Europe (and other countries or continents: Australia, the USA under Trump, etc.). So that there is no middle ground: either hospitality, or enmity, i.e. various forms of elimination. This is our choice, and our problem for the years to come, perhaps for decades. Europe in crisis: which ‘new foundation’?